What looks like a giant postcard and reaches audiences in the thousands—even millions, depending on its geographic location? The traditional roadside billboard, of course. 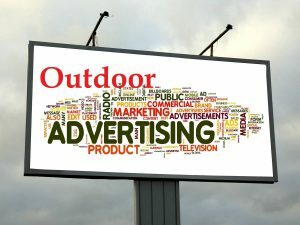 And while it can be difficult to measure exactly how many people actually see a billboard ad, digital technologies are making it easier for interested viewers to take action on an advertised offer—and that’s music to the direct response marketer’s ears. If you place two similar lead generation offers side-by-side, and then look at their campaign results, you might notice something. The better performer isn’t necessarily the one that “looks better” or says “the perfect thing.” It’s the one that’s more effective in connecting with its intended audience and driving response. Simple, right? While there isn’t a secret formula for achieving a highly effective offer—one that always delivers on your hopes and dreams (and yes, your hard work! )—there are certain elements that demand careful attention. Why? Because you’ll identify them in the most successful campaigns. 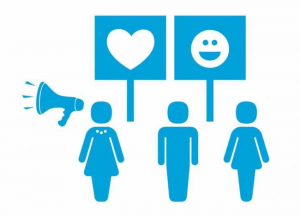 Marketers love their brand advocates as much as (maybe more than) their brand advocates love their company. What’s not to love? These customers sing your praises without being asked to, like a doting parent or best friend. But unlike a doting parent or best friend, they’re not obligated to do so. They just honest-to-goodness do. For the direct response marketer, this means they “take action” without a specific offer from you. They’re so far into their customer journey there’s no looking back—they’re already sold and still buying. Not only will they “click here,” but they’ll recommend you to their friends, family, and colleagues. Is the brand advocate the holy grail of the direct response marketer? What’s In the Direct Response Marketer’s MarTech Stack? Do you hear trendy MarTech terms like “machine learning,” “contextual marketing,” and “natural language processing” and shrug your shoulders? Do you wonder if your company should be getting into “artificial intelligence” and hiring robots to write your copy? Well…maybe not. But for even the most technically proficient among us, it’s all a bit overwhelming. But bear with us, because marketing technology is empowering marketers like never before. The MarTech landscape continues to grow by leaps and bounds—and the fruits of its labor are helping marketers understand, reach, connect with, engage, and delight customers in incredible ways that impact lead generation, conversion rates, sales, and more. MarTechAdvisor defines “MarTech Stack” as a business’ selection of tools chosen to make marketing operations and processes more effective and efficient. It’s important to consider which apps can help you streamline your processes and meet your specific direct response goals, so let’s take a look at what types of solutions are out there—and what specific tools you might want to start using. We’ll start with a wide-angle view of MarTech to give you a feel for the scope of the industry. 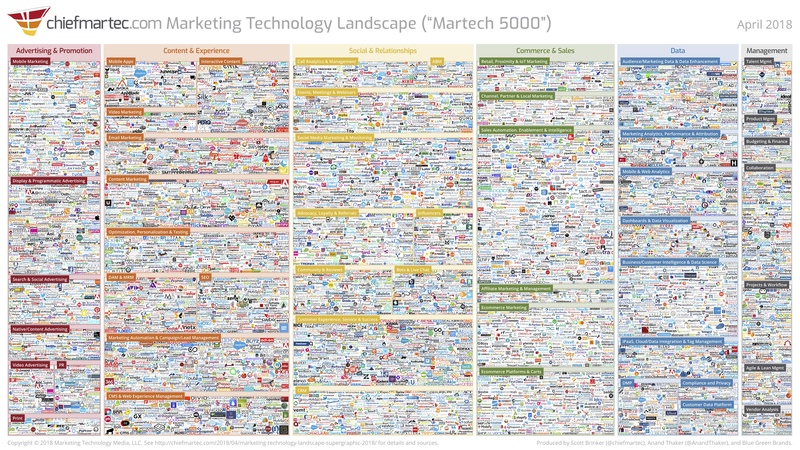 The folks at ChiefMarTech.com have been producing what they refer to as the most loved-and-hated slides in marketing: the MarTech5000. In 2011, it contained just 150 solutions; in 2018, it contains over 6,000 solutions from just as many vendors! · Advertising & Promotion: mobile marketing, display, and programmatic advertising search and social advertising, native/content marketing, video advertising, PR, and print. · Content & Experience: mobile apps; video marketing; email marketing; interactive content; content marketing; optimization, personalization, and testing; digital asset management and marketing resource management; SEO; marketing automation and campaign/lead management; and content management system and web experience management. 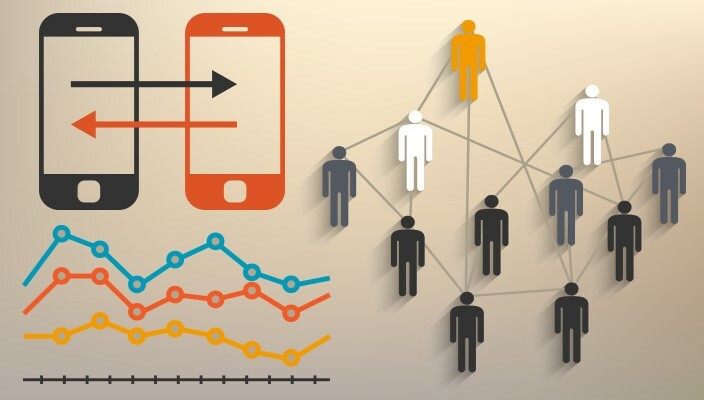 · Social & Relationships: call analytics and management; account-based marketing; events, meetings, and webinars; social media marketing and monitoring; advocacy, loyalty, and referrals; influencers; community and reviews; bots and live chat; customer experience, service, and success, and customer relationship management. · Commerce & Sales: retail, proximity, and IoT marketing; channel, partner, and local marketing; sales automation, enablement, and intelligence; affiliate marketing and management, e-commerce marketing, and e-commerce platforms and carts. · Data: audience/marketing data and data enhancement; marketing analytics, performance, and attribution; mobile and web analytics; dashboards and data visualization; business/customer intelligence and data science; iPaaS, cloud/data integration and tag management; compliance and privacy; data management platform; and customer data platform. · Management: talent management, product management, budgeting and finance, collaboration, projects and workflow, agile and lean management, and vendor analysis. As you can see, there’s a piece of software available for just about any marketing function you can think of—and what’s on an offer to marketers keeps evolving. 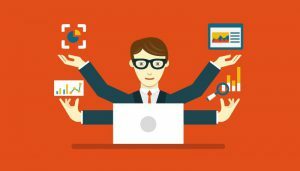 So What’s In Your MarTech Stack? Even though there are nearly 7,000 MarTech solutions on the market, your company probably only needs a few. After all, Cisco’s marketing stack has “only” 39 technologies. What matters is that you’re leveraging marketing technology in some capacity to help you work smarter, more efficiently, and better meet your customers’ needs. Today’s direct response marketer is focused on many things, with emphasis on lead generation and nurturing, conversion optimization, and delivering intuitive customer experiences meeting increasingly digital expectations. Zoominfo– gives you access to a comprehensive consumer database and provides a platform for identifying, connecting, and engaging with qualified prospects. For the direct response marketer: more qualified prospects for your next campaign. SalesForce – offers various cloud-based customer success tools to help you connect with customers across sales, marketing, customer service, communities, and more. For the direct response marketer: keep everyone on the same page while nurturing sales leads and customer. Hootsuite – provides a single dashboard for managing all of your company’s social media and social media marketing efforts. For the direct response marketer: no need to manually toggle back and forth between social media channels. Google AdWords – offers online advertising services to help you reach and connect with web users on Google’s search engine or consuming content within the Google ad network. For the direct response marketer: run highly targeted PPC ads while controlling spend. Optimizely – makes it easy for you to for optimize digital campaigns using their experimentation platform. For the direct response marketer: takes your testing to the next level with sophisticated tools. Crazy Egg– helps you understand, through visual reports, how visitors are engaging with your webpages. For the direct response marketer: identify where CTA sweet spots are by seeing where visitors are clicking. Brightcove – supplies you with an online video hosting platform and online video player solution. For the direct response marketer: makes it easy for you to get started using video in your promotional efforts without having to hire a production team. The Weinstein Organization’s custom web portals for national retailers and sales organizations allow store/branch managers or sales reps to quickly create personalized and customized campaign materials (like flyers and mailers) that are brand consistent and legal department-approved. And now, they can create custom ads—with local copy personalization and images—that fit the exact size and output specs required by a publication. 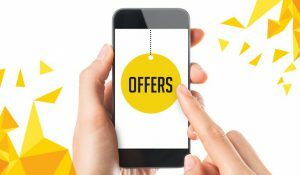 For the direct response marketer: enables national brands to make targeted offers to local markets, simple and affordable.